You can also buy tickets conveniently on the go with the BVG apps... download them from the app stores and install them free of charge. PrintTickets: Tickets for self-printing (day tickets, tourist products) can be purchased here. 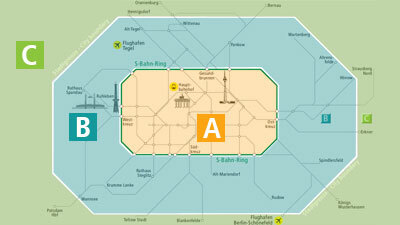 PrintTickets are only available for the Berlin AB tariff zone. After you have selected a PrintTicket, you can select the date (for some tickets also the time). By default, the logged in customer with name is always the default, but you can also buy several PrintTickets for passengers who must then enter the passenger name under "Ticket is for someone else". You are also welcome to purchase our entire range of tickets at our service counters, customer centres and ticket vending machines. You can also buy a limited range of tickets on the bus and tram.